The P-47 Thunderbolt of Robert S. Johnson heads back to England after being heavily damaged and plunging from 20,000 ft. Wounded and unable to bail out of his aircraft the pilot turns to see the FW-190 flown by German ace Egon Mayer closing in on him. Mayer relentlessly unloads the rest of his ammo on Johnson, but the American keeps flying. Mayer then pulls along side Johnson to inspect his surviving aircraft. After flying together for some time the German pilot salutes the American and pulls away. 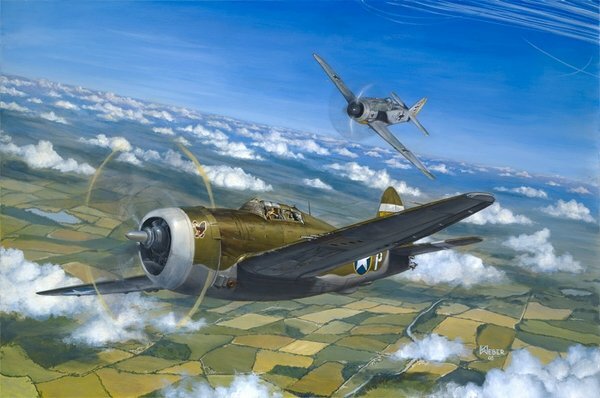 Johnson crashlands safely back in England and survives to become one of the top American aces in WWII with 27 aerial victories.